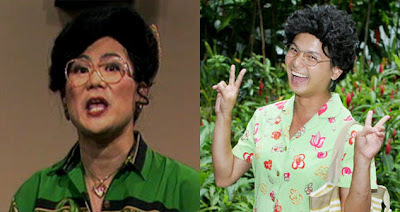 S M Ong: What's with all these cross-dressing comedians in Singapore? What's with all these cross-dressing comedians in Singapore? I dressed like a girl and I liked it. I might not have looked as hot as Katy Perry, but I did it just to try it. My excuse is that I was young, I was in college in the US and I was going to a Halloween party. I wore lots of eye make-up, some blusher, my girlfriend’s lipstick, her hairband, her black top and her black Fido Dido leggings – plus my own army boots. The look I was aiming for was scary goth chick, albeit a scarily big-boned, flat-chested goth chick in rather unscary Fido Dido leggings. Thinking back now, I realised I might have looked like Marilyn Manson – except for those damn Fido Dido leggings which were just dorky. At least it turned out better than the time I shaved my eyebrows. I mean I could simply change my clothes and wash off the make-up, but it took months for me to grow back those damn eyebrows. As much as I enjoyed playing dress-up that one time, I’m not making a career comeback out of it. Yes, I’m looking at you, Jack Neo. What does it say about Singaporeans that some of our most popular comedians are men in drag? 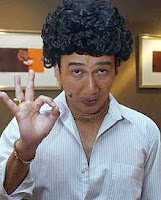 There’s Neo as Liang Po Po and Liang Ximei, Dennis Chew as Aunty Lucy, Kumar as Kumar and Gurmit Singh as Phua Chu Kang. Wait a minute, you say, Phua Chu Kang isn’t drag. I say he’s wearing a wig, make-up and a costume, he might as well be drag. When I was working at MediaCorp in the 90s, I was told that it was forbidden to have men dressed as women on local programmes – with the special exception of Neo. For a while, Kumar was thought to be banned from TV after The Ra Ra Show until it was clarified that he just wasn’t allowed to appear as a cross-dresser. Unfortunately, Kumar out of drag is not as funny as Kumar in drag. But things change. Today, Chew’s Aunty Lucy is carrying on from where Neo’s Liang Ximei left off. Both Kumar and Gurmit have played women on Channel 5 in recent years. You would think that cross-dressing is a can’t-miss gag, but the PCK episode where Gurmit did it was among the lowest rated of the series. So is it a good idea for Neo to play another female character for his next movie, Homecoming, eight years after he last played Liang Ximei on TV? Comedically, it’s going backwards, but as a marketing ploy, it’s brilliant. The movie won’t be out until Chinese New Year and we’re already talking about it. The easy joke is that instead of other women, the Cultural Medallion-winning film-maker, scandalised by an extra-marital affair eight months ago, can now have an affair with himself. But will the new movie be a hit? Of course, it will – it’s a Jack Neo movie. But then I said the same thing about the PCK movie. And I thought Fido Dido leggings were a good idea. Overcharged: How can we trust bus companies now?